How do I recover when Power*Tools crashes from a moved or deleted library? When Power*Tools will not start up because the library file has been moved or deleted, you must clean the registry. 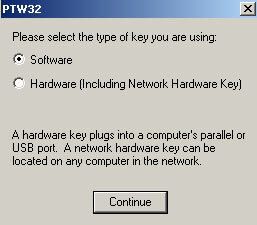 Step 1 - Click the Start Button, Navigate to Programs - Power Tools for Windows and select 'Delete PTW32 Registry Key'. Step 2 - Select 'ALL settings in the registry for PTW' and click 'OK'. A new window will display that the registry has been cleaned up. Step 3 - Launch Power*Tools for Windows. When prompted, select the appropriate key that you are using. After successful completion of the above steps, Power*Tools should now operate.